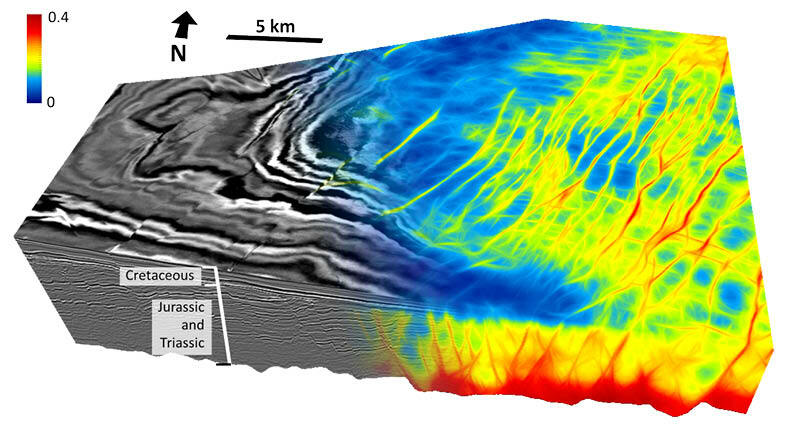 The Exmouth Basin block HCA2000A imaged as a merged composite of the seismic data on the left and the Fault Plane attribute on the right. Source: Eliis. In order to build an accurate geological model of the earth, it is essential for the seismic interpreter to understand clearly the structural network of the seismic dataset. This has been traditionally achieved by manually picking the faults identified on seismic images, which is both a tedious and time-consuming task. Great efforts have therefore been made over the last two decades to accelerate and automate the detection of faults. Several seismic attributes such as coherency, variance and chaos have been used to capture the fault locations, but with limited success due to the impact on the attribute values of seismic signal heterogeneities in the vicinity of the faults. The methods that have to date delivered the best results are based on the structure-oriented semblance attribute, with the Fault Likelihood method developed by Dave Hale in 2013 at the Colorado School of Mines being one of the best-known techniques. More recently, machine learning approaches have sparked a lot of interest, but they require a large amount of data to train the software. Hence, without sharing huge datasets amongst the oil and gas community, quickly obtaining accurate results through machine learning methods may remain a considerable challenge for the foreseeable future. However, alongside these efforts a simple innovative three-step design method has become available for detecting and creating faults following a semi-automatic workflow. Fault Plane attribute in time-slice and fault orientation filtering tool. Deformation artifacts at the top of the block linked to seismic acquisition caused the generation of faults that are not filtered in (a) and filtered in (b). Source: Eliis. In the first step, a new attribute called Fault Plane is derived from the optimised variance of the seismic volume. The variance of each voxel is computed from the average vector field and the maximum variance along a scanning disk in the three dimensions of the volume is detected for the best combination of strike value (0°–360° horizontally) and of dip value (0° and 90° vertically). The result of this computation, which does not require the calculation of full dip and strike volumes, is the Fault Plane attribute volume. In the second step, the extrema of the Fault Plane attribute are extracted through a thinning process, whereby the maxima of the gradient vector are detected. The thinned Fault Plane volume thus created highlights the skeleton structure of the fault network. In the third step, groups of voxels are created from the skeleton of the thinned Fault Plane volume and linked together to form fault patches. Those patches, based on several customisable parameters such as the value of the voxels, the dimension of the groups and their planarity, are sorted to keep only the most significant ones, which are transformed into elementary fault planes. These elementary fault planes are made up of fault sticks along the inline and crossline directions closest to the perpendicular of the fault plane azimuth. Once the elementary fault planes are automatically generated, the challenge is to reduce and simplify the structural framework by quickly sorting, organising and merging the resulting objects. The technology allows the user to sort the faults by dip, azimuth and size, the values of which are filtered by means of an interactive stereonet. The resulting objects are distinct fault sets sorted by fault types: regional/local, fault/fractures, azimuth range, dip range, reverse/normal faults. Additionally, a semi-automatic fault-merging assistant is available to solve the jigsaw puzzle of elementary fault planes. The tool detects which elementary planes are the most likely to be part of a single fault plane and merges them together into a brand new fault. The merging proposal is performed as a function of the vicinity, azimuth and dip of the fault planes and reduces the number of fault objects, thereby cleaning the output of the automatic fault extraction with a rapid hands-on solution. Final fault sets after global management (fault orientation filtering and merging of the elementary fault planes). Source: Eliis. The method described above was tested on the Exmouth sub-basin, located in the Carnarvon Basin, offshore North West Australia, which has proven oil-bearing reservoirs in fluvio-deltaic sands of the Mungaroo Formation (Middle to Late Triassic) and deltaic sediments of the Barrow group (base of the Early Cretaceous). The basin is made of complex faulted Permian, Triassic and Jurassic intervals related to the Late Triassic to Late Jurassic rifting of the Exmouth Plateau. The main fault set of the studied zone is essentially striking northnorth-east. 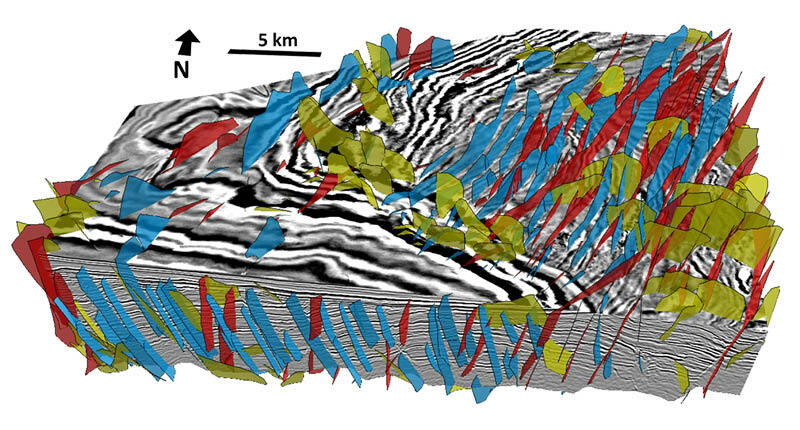 The result of the Fault Plane highlights the contrast in deformation in the different stratigraphic intervals of the basin: the interpreter can easily observe a dense fault network in the Triassic and Jurassic intervals. With closer observation, it can be noted that the geometry of the fault planes fairly captures the geometry of the deformation and fault relays. By applying the automatic fault extraction workflow to the 650 km2 Exmouth seismic dataset, more than 2,200 elementary fault planes were created in a few hours. Obviously, the structural interpretation time has been drastically reduced by delivering fault sets in a fraction of the time needed to manually pick the faults, even when factoring in the time spent in sorting and merging the elementary fault planes that were automatically picked. 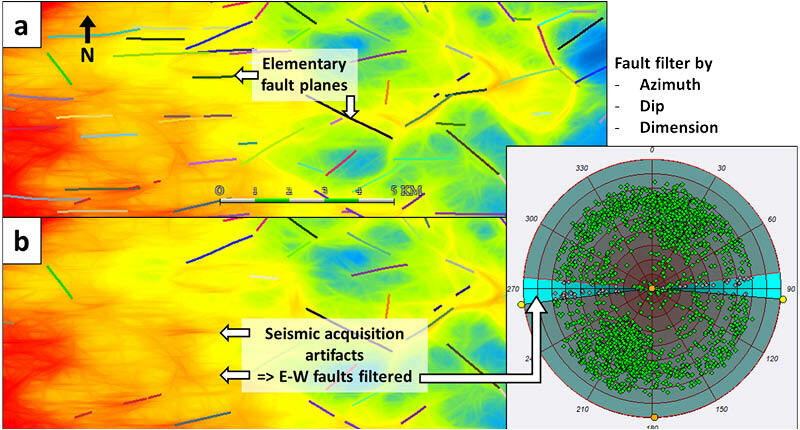 After applying the filtering and merging tools, the elementary fault planes were combined into a set of 1,500 faults with structurally consistent geometries. The semi-automatic fault extraction presented here is now ready to be implemented in industrial seismic interpretation workflows. The method presents the benefit of a simple workflow and avoids falling into the classic pitfall of cumbersome computation. As a consequence, the speed of the Fault Plane workflow is comparable to that of the Fault Likelihood method, and significantly faster than manual picking. Contrary to machine learning approaches, the method also does not require a large training dataset, giving it the great advantage of being independent of third-party information. Moreover, the workflow is customisable and can use attributes other than the variance as input to the computation of the Fault Plane. After fault extraction, the elementary fault planes are combined quickly thanks to the orientation filtering tool and the fault merge assistant. The interpreter keeps control of every step of the workflow and can adapt it to the structural style of the investigated seismic. The examples presented in this article were obtained using PaleoScan™, software developed by Eliis. The authors would like to thank Geoscience Australia for their permission to publish the data from block HCA2000A (Exmouth).